Verifying your model and code throughout development increases confidence in your implemented system. 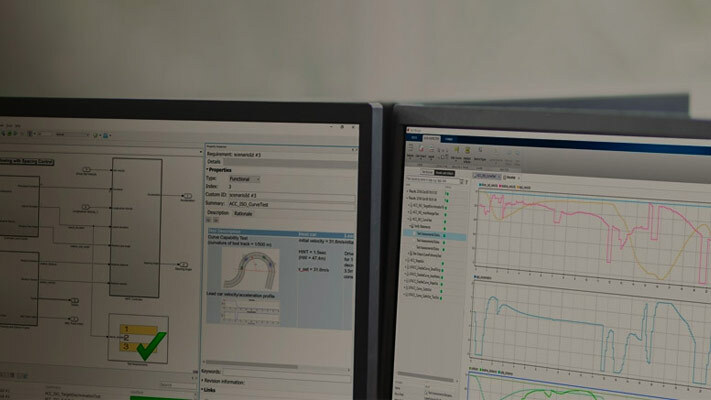 Simulink Check™, Simulink Coverage™, Simulink Requirements™, Simulink Design Verifier™, Simulink Test™, and Polyspace® help support your model and code verification process. Early in development, you can create a high-level system model and link to requirements documents. The system model can serve as an executable specification and basis for more detailed models. Validate requirements by executing your system prototype connected to user interfaces or plant hardware. Model verification includes checking against standards, checking for design errors, proving properties, and running simulations to demonstrate that results match expected output. Coverage measurement indicates how extensively tests exercise the model. For generated code, run the same tests to demonstrate code–model equivalence. Generated and handwritten code follows a similar verification process. Measure model or code coverage to determine the extent that the code is tested. Check the code for errors, check standards compliance, and analyze code metrics. Add tests, refine the system, and refine requirements until the design is fully functional, demonstrates no unintended behavior, and is fully tested. Associate your model with detailed requirements, demonstrate traceability, test against requirements. Detect and resolve design errors, check against standards, analyze functional dependencies, and prove properties. Analyze functional dependencies, test model components in isolation, create suites of test cases, test models and code to achieve coverage.